Intensive drawing program required to advance to the second year painting program. All skill levels are welcome to join the part-time atelier. In order to receive the benefit of the atelier program, students are encouraged to commit to, at the very least 12 hours in studio per month. 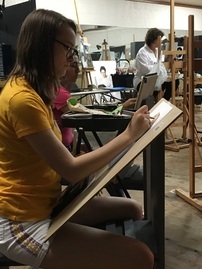 Students attend Thursday scheduled sessions for instruction and studio time. Students should plan ahead for holidays, travel and studio closing to get their hours in each month. Unused hours may not be rolled over to the next month. Please contact Leslie to reserve a space if you have to miss you regularly scheduled session. We accept checks payable to OACA, and cash for tuition. Tuition is due on the first day of each month. A $35 late fee applies to payments made on or after the 6th day of the month. A 3 month commitment is required for all atelier programs with 1 month notice of cancellation. PLEASE READ OUR PAYMENT POLICIES BELOW. When enrolling in an atelier program or class, you agree to our terms and payment policies. OR Thursday, 10 - 1 or 4 - 7 p.m.
OR Saturday, 10 - 1 p.m.
Students attend up to 12 hours of scheduled instructional sessions per month. Students attend up to 8 hours of scheduled instructional sessions per month. Students attend up to 6 hours of scheduled instructional sessions per month. •• Please submit your registration using the buttons provided for each session or class option. You may pay for the course with credit or debit online or in studio, or you may pay via check or cash. Tuition is due on the 1st day of each month (a $35 late fee applies to payments made on or after the 5th day of each month). Attend Open Studio with a live model. This is a free 3 hour uninstructed studio session. A $10 model share fee and reservation is required.